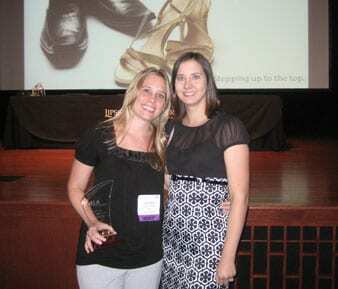 SOLID member Jessica Myers (L) was a winner at the 2009 Nashville Emerging Leader Awards, held recently at David Lipscomb. Myers is Bluewater Music's Manager of Administrative Services. Pictured at the awards with SOLID Pres. Alicia Warwick (R). SOLID (Society of Leaders In Development) will hold its new member recruitment party on Wednesday, Sept. 16 at The Rhythm condos located on 501 Demonbreun Street, 5th Floor. Potential members are invited from 5:00 to 7:30 PM to meet and mingle with current SOLID members and alumni. Food and drinks will be provided. Those who have been working in the music business for a year are eligible to apply. Check out www.solidnashville.com for more information. Applications must be in by Oct. 31.